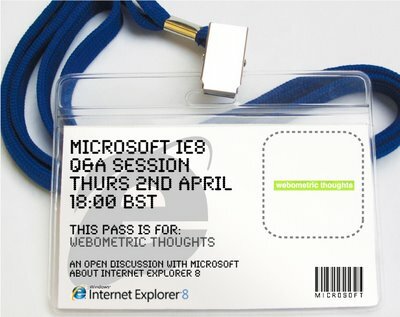 Internet Explorer 8 Virtual Q&A: Time for the bespoke browser? I have just spent the last hour having a chat with some people at Microsoft about Internet Explorer 8 (using Tangler). Whilst I first tried IE8 over a year ago, I have been a pretty solid Firefox user since then; Firefox wasn’t a deliberate choice, just something I floated into over time. IE 8 is full of bells and whistles, and whilst the technorati may make use of them, does the average user? Are they actually becoming a hindrance to the average user? Not only slowing down the program, but adding confusion to the browsing experience. I think it is time to move beyond the one browser fits all model. At a minimum I would like to see Microsoft develop two browsers: IE Simple, and IE Professional. But what I would really like to see is a bespoke browser. You go to the Microsoft site, select the browser features you want included, and it compiles the IE browser for you. I have never been a fan of April Fool’s day. It’s not that I have been emotionally scarred by some outrageous prank, I just don’t get the idea of pleasure from making someone else feel foolish. However, I’m in a bit of a quandary today as I did enjoy the Guardian’s Twitter story: Twitter Switch for Guardian, after 188 years of ink. If all April Fool’s were like this, the day would be much nicer.